What a joy! I came 3000 miles from Santa Cruz, CA to spend a couple of days in NYC I had not visited in decades. Staff and even my dorm mate gave me excellent advice. When it came time to go to the airport, staff called me a cab and when they said it would be x amount and arriving in 5 minutes they were spot on! It was the quintessential city experience, and I loved every minute of it. Consider renting a lock there: my luggage lock was too small to work well on the storage unit under the bed. The Local is a really good hostel with a nice bar/cafe and common sitting area on the first floor. The rooms are standard and the staff are very nice. They had evening events, but I didn't end up participating because I happened to not be around during those times. There didn't seem to be a lot going on in the neighborhood around the hostel, but I never felt unsafe. It's two blocks to the nearest subway station, making it easy to get into Manhattan. I would definitely stay there again. Large , spacious and airy hostel. Close to supermarket and subway. Helpful friendly staff who assist with maps and information Great kitchen. Even 2 dishwashers. I liked that the toilet was separate from the bathroom and bedroom. Able to control temp in the bedroom. It was a great place for the night that I stayed. The staff was friendly and helpful. The rooms, bathrooms etc were very clean. It had a cool young and hip vibe to it. I would definitely recommend friends to stay. 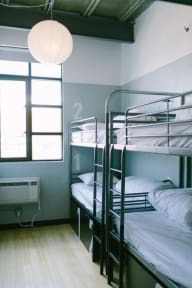 Good hostel to stay in. Location was fine - easy subway ride into the city. Staff were very nice. Nice bar there too to meet people. The staff were friendly, and enthusiastic. I really appreciated their character. The common space has plenty of room to chill, with a great bar. The rooms were basic, but thoughtfully planned and mostly clean. Some things such as power outlets were broken, as were sinks and a couple of other things depending on the room (stayed in 2). Bunk curtains for added privacy would be nice. Value was alright for being NYC, however, things such as holding luggage shouldn’t come at a cost. 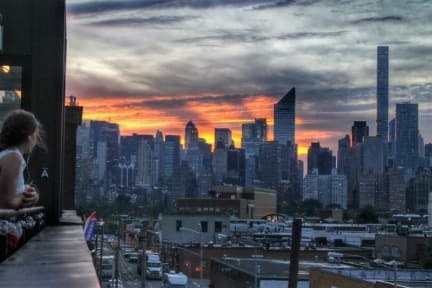 Not a nice neighborhood, mostly warehouses, but great view on Manhatten Skyline. Need Subway to City Center, but station is close. Small kitchen with basic facilities, Supermarket close. Rooms are cleaned everyday. Bar with a free drink from 5pm to 8pm. I had a good stay at The Local. The staff were friendly and the roof deck view was amazing. I had guests both arriving late and throwing up in the bathroom sink, but that's the luck of the draw when staying at a hostel. If I could suggest anything it would be to put door bumpers on the doors to quiet them when closing. I checked out around 7am and was told that the coffee available was for sale and not free to guests. Free tea and coffee for those leaving early would be helpful. The clean rooms with a private bathroom are great. I didn't find it to have a very hostel feel - no social interaction encouraged through activities and no planned activities ever took place. While the staff at the reception is friendly, they were clueless about food recommendations or things to do nearby. The location was okay - not far from the subway however still very isolated. The roommates I had were not great-occupancy doubled overnight. I didn't get to enjoy the bar. Not value-for-$$$.